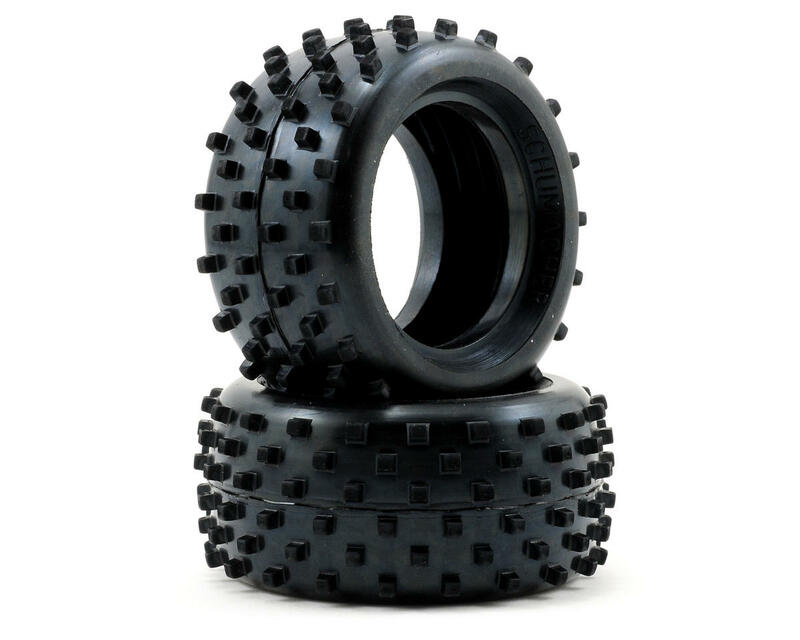 For any buggy owners out there, these tire ROCK. My son runs a Bandit vxl, mostly in a dirt pit and these tires hook up fantastic. Great wear in the dirt. Run them on the asphalt and expect the front end to see the sky. He is on his second set and would recommend them to everyone. My son runs his car like a mad man and these tires took alot of damage and still run like they should. For anyone that is on a buggy budget run these tires...... Thanks. While these tires will be good for racing on a kinda damp/muddy track, the real let down is that they're not a 2.2" tire. it was an effort to stretch them over the rim. if they were a 2.2" tire i'd give it 5 stars. I use these tires in yellow compound on astroturf. I have used all the schumacher tires in turf and, while all work well, the blocks in yellow are definately the longest lasting and perfect grip with the short turf I run on. I highly recommend trying some side by side with mini- pins to see the difference. Mini-pins have more grip initially...but wear quite fast and become too loose. I do not recommend mini-spikes on buggy only because they wear quickly and get looser than the mini-pins do. Mini-spikes do work well on 2wd sct on turf though. For some reason they last a while and are consistent on sct. Hope this helps!!! Intro: These are being raced on the rear of a Yokomo YZ-2 on short pile outdoor astroturf track using AKA red closed cell foam in north Texas. MUCH longer tire life than DBoots Multibyte or Schumacher Mini Spikes. The mounting bead is very narrow; I ended up mounting them to the inner ribs of the wheel rather than the normal outer ribs. 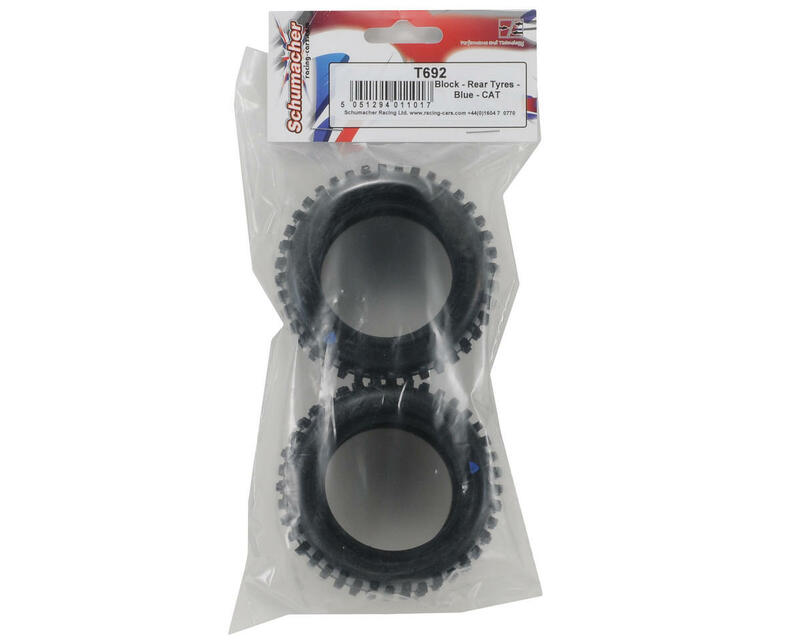 They are a bit smaller than the 2.2" wheels and the compound is very hard; so its a bit of a struggle stretching it over the wheels. I am very impressed with the grip and handling of these tires with closed cell foam inside. The other tires mentioned above tend to last about 1-1.5 race days before they worn out. I have 2 race days on these (TQ'ed and Won both race days!) and they still have much of their life left; I'd have to guess 75-80%. I wouldn't hesitate to say these will last me at least 6 race days probably more; I'll have to see how the traction fades as they wear. So from a handling and budget standpoint I can overlook the mounting difficulties; and highly recommend these for short pile astroturf. These are the hardest tire I have ever run on any toy... they give the longest life also a bit tough to mount.. yet worth it great price also..
these tyres are great on grass, but are usless on any other flat surface, they will not grip and will leave the rear end of your rear wheel drive buggy bouncing around struggling for grip. tyre life isn't that great either as soon as the tread wore down a couple of millimeters the rest of it went down quite quickly.